In her regular column Contemporary voices Elaine Chiew explores books and authors making waves around Asia, and beyond. Here she discusses State of Emergency, by Jeremy Tiang, from Singapore. What Tiang did brilliantly is sidestep the history pedagogic lesson – for those unfamiliar with Singapore’s left-wing history of insurgency, Tiang’s acknowledgements will give you a good list of sources to start with – and show us rather the inner lives of characters intimately bound up with these events. Meet Siew Li, one of six point-of-views Tiang uses to tell this multi-generation story. Tiang casually slips in history with personal narrative by having Siew Li meet Jason, another of the six perspectives, during the Hock Lee Bus Riot. The historical context one may not be familiar with is that Hock Lee, infamous as it is, was one of 200 protests that had occurred in 1955 alone. “State” is thus an apt word for the heady, turbulent post-War political atmosphere surrounding the incipient days of a young nation trying to define itself vis-à-vis its colonial legacy. Tiang alludes glancingly to key players during this period, the brewing discontent with Malaysia, the rise of Lee Kuan Yiew, but remains faithful to the micro-narrative, the observed detail, the living of each single life. The last two perspectives are Nam Teck and Stella’s. Nam Teck and Revathi’s perspectives sandwich us in a retelling of the Batang Kali massacre and Teck’s recruitment into the Communist guerrilla movement circa 1962. Stella’s focusses on a blow-by-blow fictional retelling of her trumped-up incarceration and interrogation as part of the 1987 round-up of Catholics. Tiang’s direct handling of such sensitive material is relentless and brave as is his decision to complete the book despite having the remainder of his National Arts Council grant withdrawn. The crux of the question is: what power can literature wield that a straightforward historical account can’t? What agency does a reprisal of traumatic historical incidents in literature confer? Tiang’s stitching of historical incidents within six individual lives is handled with skill, but within the invisible intersections of these lives – Keats’ concept of ‘negative capability’ – the understory within each palpable story is murkier. One perhaps hopes to find not only the emotional significance that history has on individual lives, but also how individuals themselves – unwittingly, unconsciously – shape the historical narrative of their time. Here, rendered in good, serviceable prose, these voices seem indistinguishable one from another – their lives either truncated or uplifted by these watershed events: Jason still mired in his wife’s abandonment, Stella’s teaching career halted by her imprisonment, Revathi’s journalistic advancement sealed by her Batang Kali exposé. The novelist may be in thrall to the long shadows of history, but the individual character’s gaze is necessarily on his or her present. This means that lives unfold in manifold and complex chapters, just as history is not composed of one single linear narrative. Time distorts, soothes, immunises, recalibrates and contextualises. For example, from Henry, we learn that Jason has always snipped out and collected newspaper articles about anything and everything. Yet, such cumulative absorption of journalistic accounts didn’t seem to have infiltrated Jason’s consciousness or his son's, nor does the contrasting voice – the voice of the journalist Revathi – reflect on precisely this obligation to unearth and tell the truth about the past, the obligation to witness. These unplumbed random connections amongst the six characters could have yielded a less boxed-in narrative effect and surprising introspection. Tiang’s grapple with this particular aspect of Singapore’s past is a lifting of the lid – finally. By doing so, the collective voices of State of Emergency seem to say that the threat to society is the fear we fashion today out of what we can’t allow for tomorrow; importantly, it’s not the same thing as what we’re afraid the past will tell us. 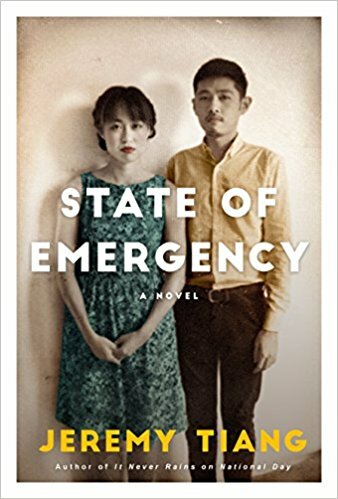 Details: State of Emergency is published by Epigram Books, in paperback, priced in local currencies.